In one of my application, I am using Tadiran Lithium Thionyl Chloride Batteries MODEL TL-5934. In the data sheet , the max pulse current shows 50mA. However, in my application, we have low duty cycle current spikes up to 70mA. Our battery are draining twice the speed as I calculate. How will these current spikes affect the battery Life?? This is our appication's current draw profile. 50000 points acquired by DMM in 50 sec. Constant current draw is very small probably 0.01mA, however, have lots of current spikes, which I suspected kill the battery much faster. 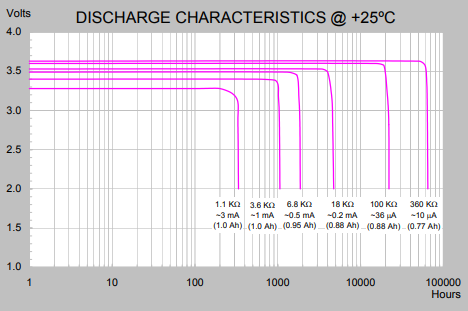 So according to the discharge characteristics you posted, the capacity actually goes up at higher currents, which is unusual. Granted the potential is a little lower so the total energy (Wh) might be roughly the same. 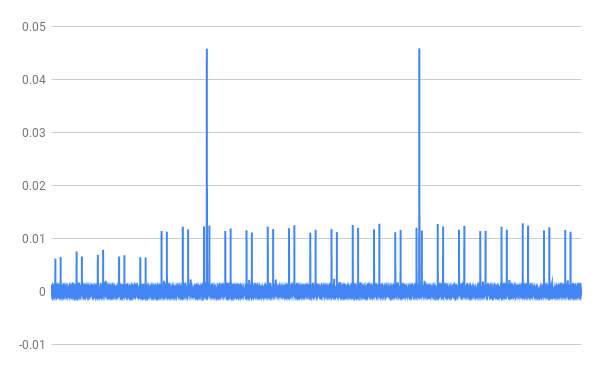 In order to know how much discharge time you're losing because of the spikes, you'd need to know how wide they are. If you integrate the sample you collected and divide it by how long that sample is, you get a correction factor. Then take your 4000 hours and divide it by this factor to get the expected discharge time from the observed current profile. If the result is significantly different than what you actually get, then there's something else going on: either your profile is inaccurate or you're pulling more current than you think you are. Not the answer you're looking for? Browse other questions tagged batteries current current-measurement lithium or ask your own question. How to test a lithium battery?